TORONTO, Ontario — Toronto's subway system saw significantly fewer people try to kill themselves in 2015 — with five attempted suicides and 11 completed suicides over the course of the year, CBC News reported. Those 16 incidents are considerably fewer than the 26 reported in 2014 and also lower than the mean number of suicide incidents on TTC subways since 1998, which is 23. Although the transit system has had suicide prevention programs in place since 2011, a TTC spokesperson doesn't attribute the lower number of suicides and attempted suicides in 2015 solely to those initiatives, the report said. 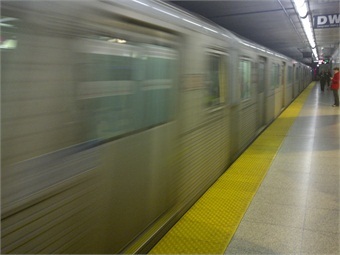 The TTC has a Gatekeeper program aimed at training frontline staff in recognizing behaviour that indicates crisis and getting help, as well as a Crisis Link program in partnership with Toronto Distress Centres, which provides each subway platform with a suicide hotline, linking callers with a trained distress centre responder, according to the CBC News report.